Luck isn’t just for leprechauns. I am pretty lucky and there’s nothing magical about me. 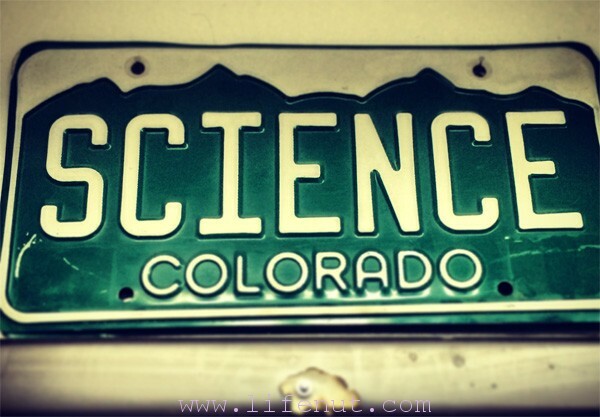 Proof: I got to visit Steve Spangler Science one morning and play with all kinds of science-y goodies. 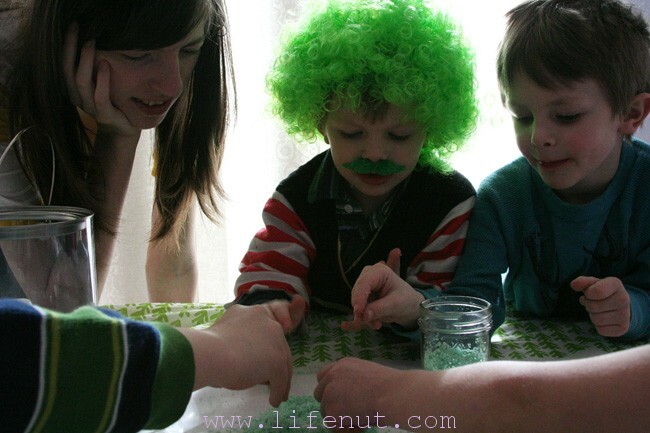 In anticipation and celebration of St. Patrick’s Day, Steve Spangler gathered 15 fun and accessible experiments and activities for families to do at home, together. I had Aidan help by reading the instructions before we got started. 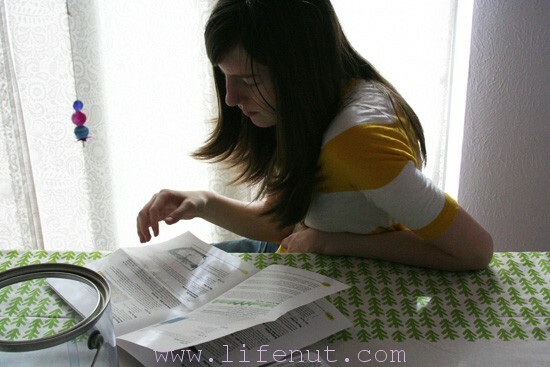 Most of the materials are included in the kit. We supplied water and tulips and UV light. Okay. The sun did that. But we were able to dive right in without a huge production. Of course, we had to make a party of it! 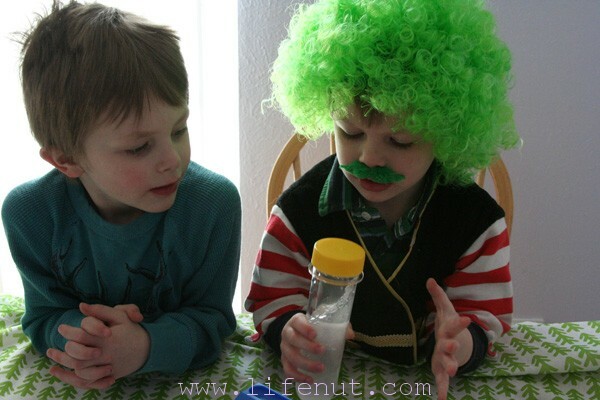 I busted out fun themed ‘staches and a green ‘fro for our junior scientists. 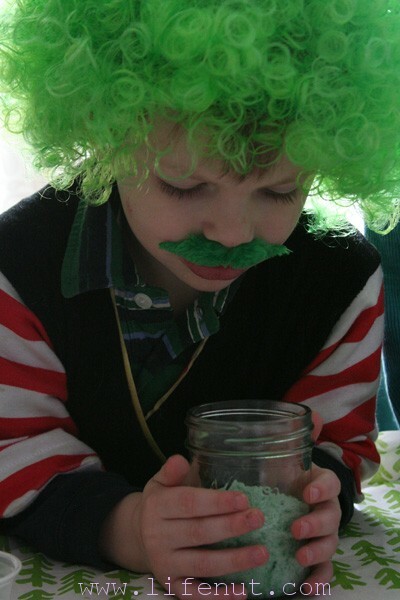 Leprechaun Scientist in the house! Note the eyewear of the junior scientist above. 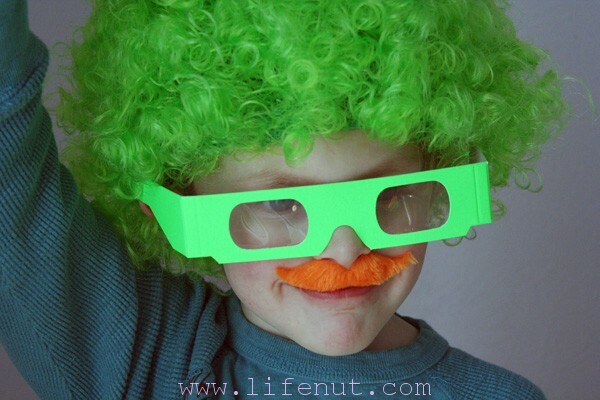 His specs enable the wearer to see things only privy to senior leprechauns. 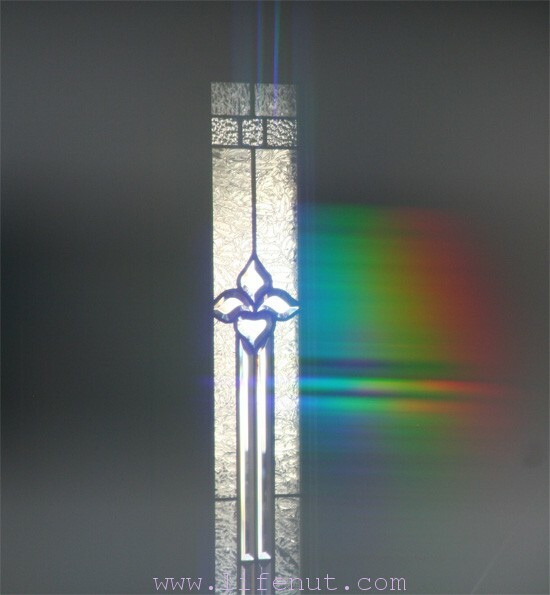 Through the magic of science, I am able to show you life through diffraction grating. It’s magically delicious! 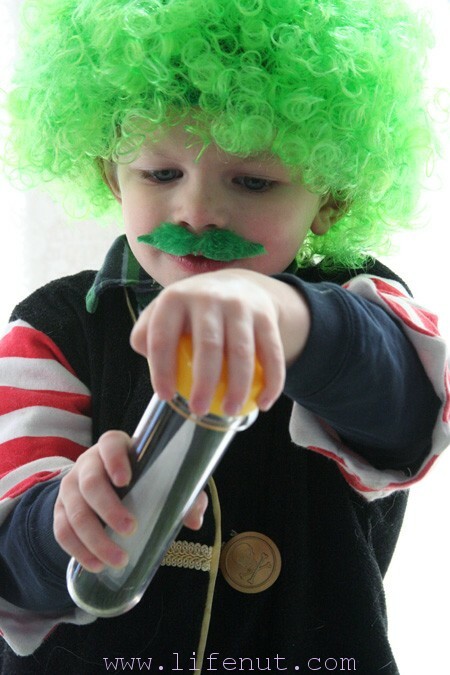 Teddy decided to pair the green hair and mustache with his pirate costume. I wasn’t going to argue because he was really into it! 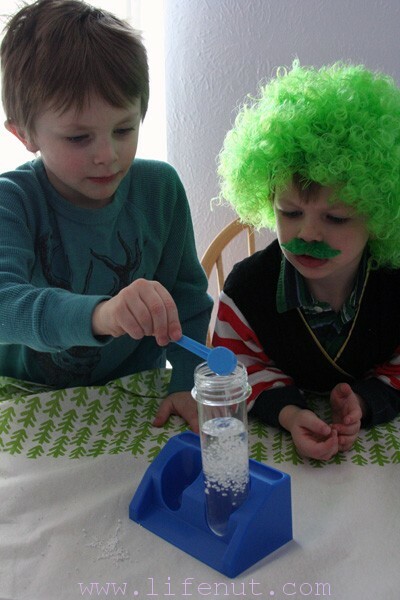 That’s the beauty of this Leprechaun Science Kit—even a three-year-old can participate and learn. Teddy made Leprechaun Snow, which teaches kids about super absorbent polymers—long chains of molecules. 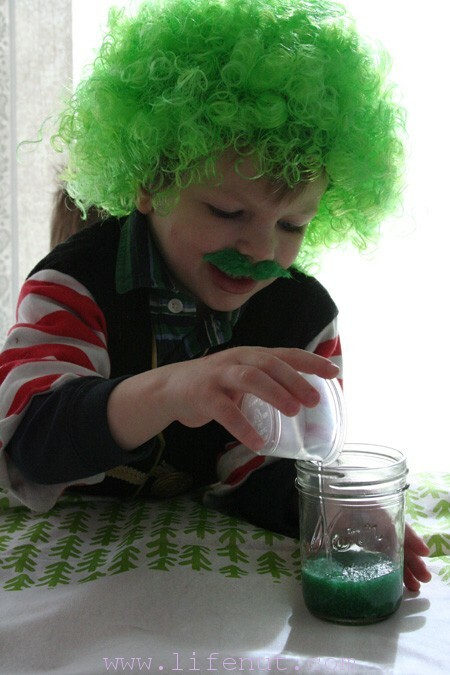 Easy enough for a three-year-old leprechaun! Investigating the fluffy green snow. 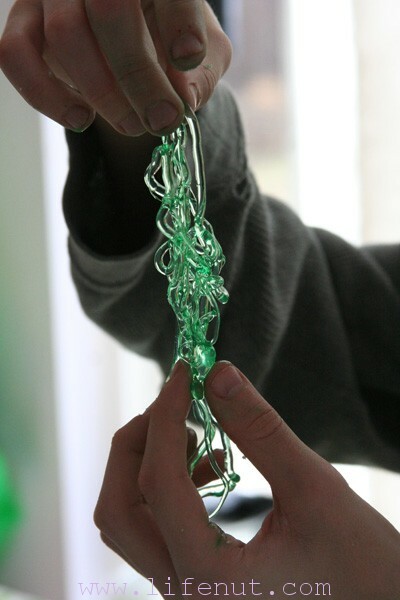 Next up, we made green worms using several simple steps. Archie and Teddy made worms together, with Sam’s help. Adding worm activator to water! Liquid meets a liquid and this happens! Archie strung unassuming white beads on a pipe cleaner. He was a bit baffled, until we encouraged him to take his bracelet outside. WHOA. More rainbows! Kids see the power of UV light in action. 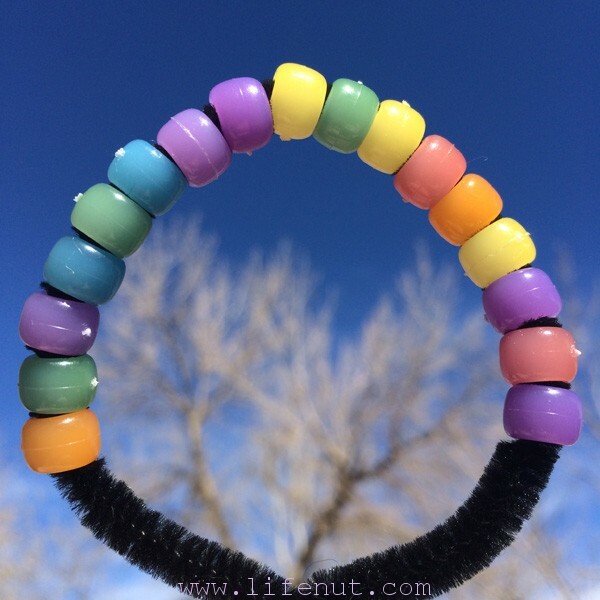 I was surprised by how quickly the beads went from white to brilliantly colored when taken outside. It wouldn’t be spring without tulips. Because Leprechauns prefer green and all we had were these plain white, we had to do something. Enter Green Fizzers. Beatrix added some to water. I helped her snip the stems and then she put them in their green drink. 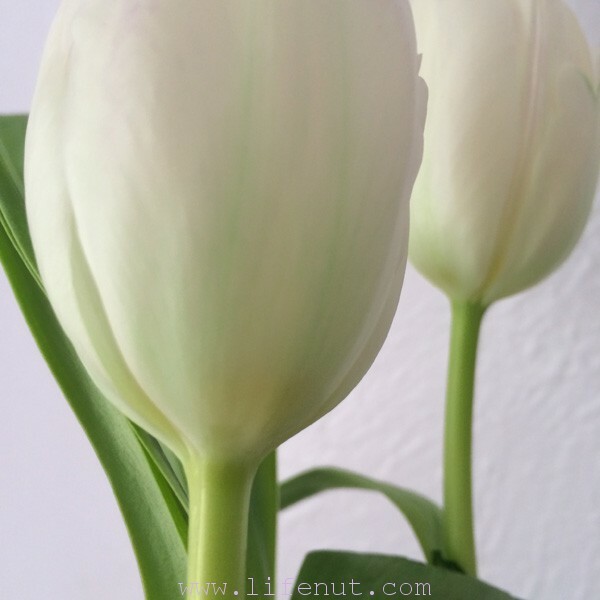 Will these white tulips turn green? About 15 hours later, we were able to see some green. The longer they soak, the greener they’ll be! St. Patrick’s Day is soon! 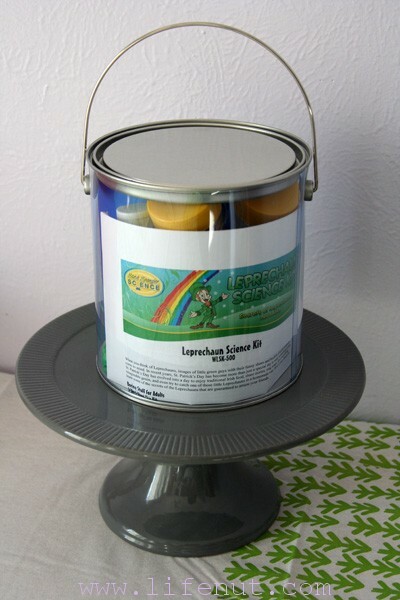 The Leprechaun Science Kit from Steve Spangler would be a fun way to bring some green into your celebration. But don’t think the kit is only fun for a limited time. It comes with cool science supplies to play with year-round, including jelly balls, fizzers, worm creators, rainbow beads, rainbow glasses, and big green bags that make excellent oversized swords. It also comes with test tubes, beakers, and a stand along with measuring scoops and cups. 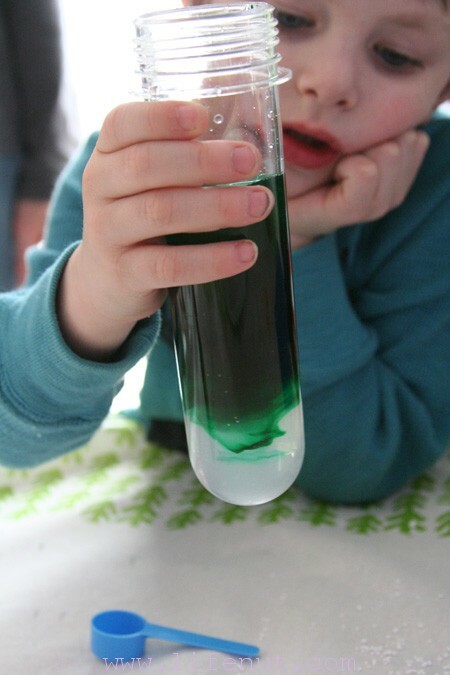 Visit Steve Spangler Science to order your Leprechaun Science Kit or to instantly download a St. Patrick’s Day Leprechaun Science Guide with even more great fun activities and experiments. We had a blast playing and learning together. Everyone from three-year-old Teddy to our teenagers enjoyed diving into the kit for a morning of fun. The green afro. It kills me. Spam word really fits this one “smartduck”. 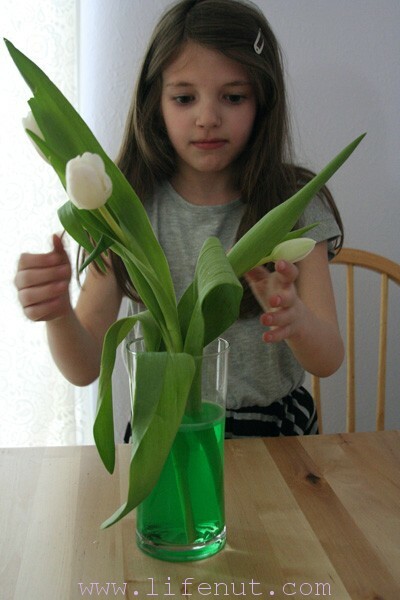 You have a whole gaggle of smartducks in your house and I loved seeing the pictures of their experiments. Looks like tons of fun and Teddy is too cute with his getup. I’m so glad you were able to come and play with us! 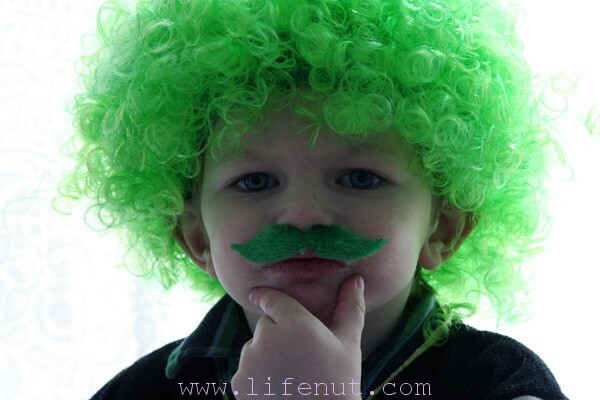 The green wigs and staches are a hoot. Thank you for sharing this with your audience. It looks like your kids had a great time. PS How big is Teddy now? He’s not a baby anymore and is SUPER cute!